"AMD64" and "Intel 64" redirect here. For the Intel 64-bit architecture in Itanium chips, see IA-64. x86-64 (also known as x64, x86_64, AMD64 and Intel 64[note 1]) is the 64-bit version of the x86 instruction set. It introduces two new modes of operation, 64-bit mode and compatibility mode, along with a new 4-level paging mode. With 64-bit mode and the new paging mode, it supports vastly larger amounts of virtual memory and physical memory than is possible on its 32-bit predecessors, allowing programs to store larger amounts of data in memory. x86-64 also expands general-purpose registers to 64-bit, as well extends the number of them from 8 (some of which had limited or fixed functionality, e.g. for stack management) to 16 (fully general), and provides numerous other enhancements. Floating point operations are supported via mandatory SSE2-like instructions, and x87/MMX style registers are generally not used (but still available even in 64-bit mode); instead, a set of 32 vector registers, 128 bits each, is used. (Each can store one or two double-precision numbers or one to four single precision numbers, or various integer formats.) In 64-bit mode, instructions are modified to support 64-bit operands and 64-bit addressing mode. The compatibility mode allows 16- and 32-bit user applications to run unmodified coexisting with 64-bit applications if the 64-bit operating system supports them. [note 2] As the full x86 16-bit and 32-bit instruction sets remain implemented in hardware without any intervening emulation, these older executables can run with little or no performance penalty, while newer or modified applications can take advantage of new features of the processor design to achieve performance improvements. Also, a processor supporting x86-64 still powers on in real mode for full backward compatibility. The original specification, created by AMD and released in 2000, has been implemented by AMD, Intel and VIA. The AMD K8 processor was the first to implement it. This was the first significant addition to the x86 architecture designed by a company other than Intel. Intel was forced to follow suit and introduced a modified NetBurst family which was software-compatible with AMD's specification. VIA Technologies introduced x86-64 in their VIA Isaiah architecture, with the VIA Nano. The x86-64 architecture is distinct from the Intel Itanium architecture (formerly IA-64), which is not compatible on the native instruction set level with the x86 architecture. Operating systems and applications written for one cannot be run on the other. AMD64 was created as an alternative to the radically different IA-64 architecture, which was designed by Intel and Hewlett Packard. Originally announced in 1999 while a full specification became available in August 2000, the AMD64 architecture was positioned by AMD from the beginning as an evolutionary way to add 64-bit computing capabilities to the existing x86 architecture, as opposed to Intel's approach of creating an entirely new 64-bit architecture with IA-64. 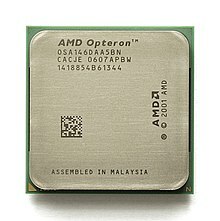 The first AMD64-based processor, the Opteron, was released in April 2003. AMD's processors implementing the AMD64 architecture include Opteron, Athlon 64, Athlon 64 X2, Athlon 64 FX, Athlon II (followed by "X2", "X3", or "X4" to indicate the number of cores, and XLT models), Turion 64, Turion 64 X2, Sempron ("Palermo" E6 stepping and all "Manila" models), Phenom (followed by "X3" or "X4" to indicate the number of cores), Phenom II (followed by "X2", "X3", "X4" or "X6" to indicate the number of cores), FX, Fusion/APU and Ryzen/Epyc. The primary defining characteristic of AMD64 is the availability of 64-bit general-purpose processor registers (for example, rax and rbx), 64-bit integer arithmetic and logical operations, and 64-bit virtual addresses. The designers took the opportunity to make other improvements as well. Some of the most significant changes are described below. All general-purpose registers (GPRs) are expanded from 32 bits to 64 bits, and all arithmetic and logical operations, memory-to-register and register-to-memory operations, etc., can now operate directly on 64-bit integers. Pushes and pops on the stack default to 8-byte strides, and pointers are 8 bytes wide. In addition to increasing the size of the general-purpose registers, the number of named general-purpose registers is increased from eight (i.e. eax, ecx, edx, ebx, esp, ebp, esi, edi) in x86 to 16 (i.e. rax, rcx, rdx, rbx, rsp, rbp, rsi, rdi, r8, r9, r10, r11, r12, r13, r14, r15). It is therefore possible to keep more local variables in registers rather than on the stack, and to let registers hold frequently accessed constants; arguments for small and fast subroutines may also be passed in registers to a greater extent. Similarly, the number of 128-bit XMM registers (used for Streaming SIMD instructions) is also increased from 8 to 16. The traditional x87 FPU register stack is not included in the register file size extension in 64-bit mode, compared with the XMM registers used by SSE2, which did get extended. The x87 register stack is not a simple register file although it does allow direct access to individual registers by low cost exchange operations. The AMD64 architecture defines a 64-bit virtual address format, of which the low-order 48 bits are used in current implementations. (p120) This allows up to 256 TB (248 bytes) of virtual address space. The architecture definition allows this limit to be raised in future implementations to the full 64 bits,(p2)(p3)(p13)(p117)(p120) extending the virtual address space to 16 EB (264 bytes). This is compared to just 4 GB (232 bytes) for the x86. This means that very large files can be operated on by mapping the entire file into the process' address space (which is often much faster than working with file read/write calls), rather than having to map regions of the file into and out of the address space. Instructions can now reference data relative to the instruction pointer (RIP register). This makes position independent code, as is often used in shared libraries and code loaded at run time, more efficient. The original AMD64 architecture adopted Intel's SSE and SSE2 as core instructions. These instruction sets provide a vector supplement to the scalar x87 FPU, for the single-precision and double-precision data types. SSE2 also offers integer vector operations, for data types ranging from 8bit to 64bit precision. This makes the vector capabilities of the architecture on par with those of the most advanced x86 processors of its time. These instructions can also be used in 32-bit mode. The proliferation of 64-bit processors has made these vector capabilities ubiquitous in home computers, allowing the improvement of the standards of 32-bit applications. The 32-bit edition of Windows 8, for example, requires the presence of SSE2 instructions. SSE3 instructions and later Streaming SIMD Extensions instruction sets are not standard features of the architecture. The No-Execute bit or NX bit (bit 63 of the page table entry) allows the operating system to specify which pages of virtual address space can contain executable code and which cannot. An attempt to execute code from a page tagged "no execute" will result in a memory access violation, similar to an attempt to write to a read-only page. This should make it more difficult for malicious code to take control of the system via "buffer overrun" or "unchecked buffer" attacks. A similar feature has been available on x86 processors since the 80286 as an attribute of segment descriptors; however, this works only on an entire segment at a time. Segmented addressing has long been considered an obsolete mode of operation, and all current PC operating systems in effect bypass it, setting all segments to a base address of zero and (in their 32-bit implementation) a size of 4 GB. AMD was the first x86-family vendor to implement no-execute in linear addressing mode. The feature is also available in legacy mode on AMD64 processors, and recent Intel x86 processors, when PAE is used. A few "system programming" features of the x86 architecture were either unused or underused in modern operating systems and are either not available on AMD64 in long (64-bit and compatibility) mode, or exist only in limited form. These include segmented addressing (although the FS and GS segments are retained in vestigial form for use as extra-base pointers to operating system structures),(p70) the task state switch mechanism, and virtual 8086 mode. These features remain fully implemented in "legacy mode", allowing these processors to run 32-bit and 16-bit operating systems without modifications. Some instructions that proved to be rarely useful are not supported in 64-bit mode, including saving/restoring of segment registers on the stack, saving/restoring of all registers (PUSHA/POPA), decimal arithmetic, BOUND and INTO instructions, and "far" jumps and calls with immediate operands. In addition, the AMD specification requires that the most significant 16 bits of any virtual address, bits 48 through 63, must be copies of bit 47 (in a manner akin to sign extension). If this requirement is not met, the processor will raise an exception. (p131) Addresses complying with this rule are referred to as "canonical form. "(p130) Canonical form addresses run from 0 through 00007FFF'FFFFFFFF, and from FFFF8000'00000000 through FFFFFFFF'FFFFFFFF, for a total of 256 TB of usable virtual address space. This is still 65,536 times larger than the virtual 4 GB address space of 32-bit machines. This feature eases later scalability to true 64-bit addressing. Many operating systems (including, but not limited to, the Windows NT family) take the higher-addressed half of the address space (named kernel space) for themselves and leave the lower-addressed half (user space) for application code, user mode stacks, heaps, and other data regions. 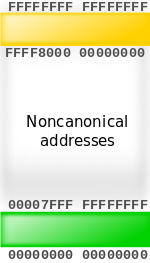 The "canonical address" design ensures that every AMD64 compliant implementation has, in effect, two memory halves: the lower half starts at 00000000'00000000 and "grows upwards" as more virtual address bits become available, while the higher half is "docked" to the top of the address space and grows downwards. Also, enforcing the "canonical form" of addresses by checking the unused address bits prevents their use by the operating system in tagged pointers as flags, privilege markers, etc., as such use could become problematic when the architecture is extended to implement more virtual address bits. The first versions of Windows for x64 did not even use the full 256 TB; they were restricted to just 8 TB of user space and 8 TB of kernel space. Windows did not support the entire 48-bit address space until Windows 8.1, which was released in October 2013. The 64-bit addressing mode ("long mode") is a superset of Physical Address Extensions (PAE); because of this, page sizes may be 4 KB (212 bytes) or 2 MB (221 bytes). (p120) Long mode also supports page sizes of 1 GB (230 bytes). (p120) Rather than the three-level page table system used by systems in PAE mode, systems running in long mode use four levels of page table: PAE's Page-Directory Pointer Table is extended from four entries to 512, and an additional Page-Map Level 4 (PML4) Table is added, containing 512 entries in 48-bit implementations. (p131) A full mapping hierarchy of 4 KB pages for the whole 48-bit space would take a bit more than 512 GB of memory (about 0.195% of the 256 TB virtual space). Intel has proposed a scheme with a five-level page table. If implemented, this would allow Intel 64 processors to support a 57-bit virtual address space. The operating system can also limit the virtual address space. Details, where applicable, are given in the "Operating system compatibility and characteristics" section. Current AMD64 processors support a physical address space of up to 248 bytes of RAM, or 256 TB. However, as of June 2010[update], there were no known x86-64 motherboards that support 256 TB of RAM. [not in citation given] The operating system may place additional limits on the amount of RAM that is usable or supported. Details on this point are given in the "Operating system compatibility and characteristics" section of this article. The architecture has two primary modes of operation, long mode and legacy mode. ^ a b c Note that 16-bit code written for the 80286 and below does not use 32-bit operand instructions. 16-bit code written for the 80386 and above can use 32-bit operand instructions, but defaults to using 16-bit operands. Long mode is the architecture's intended primary mode of operation; it is a combination of the processor's native 64-bit mode and a combined 32-bit and 16-bit compatibility mode. It is used by 64-bit operating systems. Under a 64-bit operating system, 64-bit programs run under 64-bit mode, and 32-bit and 16-bit protected mode applications (that do not need to use either real mode or virtual 8086 mode in order to execute at any time) run under compatibility mode. Real-mode programs and programs that use virtual 8086 mode at any time cannot be run in long mode unless those modes are emulated in software. :11 However, such programs may be started from an operating system running in long mode on processors supporting VT-x or AMD-V by creating a virtual processor running in the desired mode. Since the basic instruction set is the same, there is almost no performance penalty for executing protected mode x86 code. This is unlike Intel's IA-64, where differences in the underlying instruction set mean that running 32-bit code must be done either in emulation of x86 (making the process slower) or with a dedicated x86 coprocessor. However, on the x86-64 platform, many x86 applications could benefit from a 64-bit recompile, due to the additional registers in 64-bit code and guaranteed SSE2-based FPU support, which a compiler can use for optimization. However, applications that regularly handle integers wider than 32 bits, such as cryptographic algorithms, will need a rewrite of the code handling the huge integers in order to take advantage of the 64-bit registers. Legacy mode is the mode used by 16-bit ("protected mode" or "real mode") and 32-bit operating systems. In this mode, the processor acts like a 32-bit x86 processor, and only 16-bit and 32-bit code can be executed. Legacy mode allows for a maximum of 32 bit virtual addressing which limits the virtual address space to 4 GB. (p14)(p24)(p118) 64-bit programs cannot be run from legacy mode. Intel 64 is Intel's implementation of x86-64, used and implemented in various processors made by Intel. Historically, AMD has developed and produced processors with instruction sets patterned after Intel's original designs, but with x86-64, roles were reversed: Intel found itself in the position of adopting the ISA which AMD had created as an extension to Intel's own x86 processor line. Intel's project was originally codenamed Yamhill (after the Yamhill River in Oregon's Willamette Valley). After several years of denying its existence, Intel announced at the February 2004 IDF that the project was indeed underway. Intel's chairman at the time, Craig Barrett, admitted that this was one of their worst-kept secrets. Intel's name for this instruction set has changed several times. The name used at the IDF was CT (presumably[original research?] for Clackamas Technology, another codename from an Oregon river); within weeks they began referring to it as IA-32e (for IA-32 extensions) and in March 2004 unveiled the "official" name EM64T (Extended Memory 64 Technology). In late 2006 Intel began instead using the name Intel 64 for its implementation, paralleling AMD's use of the name AMD64. The first processor to implement Intel 64 was the multi-socket processor Xeon code-named Nocona in June 2004. In contrast, the initial Prescott chips (February 2004) did not enable this feature. Intel subsequently began selling Intel 64-enabled Pentium 4s using the E0 revision of the Prescott core, being sold on the OEM market as the Pentium 4, model F. The E0 revision also adds eXecute Disable (XD) (Intel's name for the NX bit) to Intel 64, and has been included in then current Xeon code-named Irwindale. Intel's official launch of Intel 64 (under the name EM64T at that time) in mainstream desktop processors was the N0 stepping Prescott-2M. The first Intel mobile processor implementing Intel 64 is the Merom version of the Core 2 processor, which was released on July 27, 2006. None of Intel's earlier notebook CPUs (Core Duo, Pentium M, Celeron M, Mobile Pentium 4) implement Intel 64. Intel's processors implementing the Intel64 architecture include the Pentium 4 F-series/5x1 series, 506, and 516, Celeron D models 3x1, 3x6, 355, 347, 352, 360, and 365 and all later Celerons, all models of Xeon since "Nocona", all models of Pentium Dual-Core processors since "Merom-2M", the Atom 230, 330, D410, D425, D510, D525, N450, N455, N470, N475, N550, N570, N2600 and N2800, all versions of the Pentium D, Pentium Extreme Edition, Core 2, Core i9, Core i7, Core i5, and Core i3 processors, and the Xeon Phi 7200 series processors. VIA Technologies introduced their first implementation of the x86-64 architecture in 2008 after five years of development by its CPU division, Centaur Technology. Codenamed "Isaiah", the 64-bit architecture was unveiled on January 24, 2008, and launched on May 29 under the VIA Nano brand name. The processor supports a number of VIA-specific x86 extensions designed to boost efficiency in low-power appliances. It is expected that the Isaiah architecture will be twice as fast in integer performance and four times as fast in floating-point performance as the previous-generation VIA Esther at an equivalent clock speed. Power consumption is also expected to be on par with the previous-generation VIA CPUs, with thermal design power ranging from 5 W to 25 W. Being a completely new design, the Isaiah architecture was built with support for features like the x86-64 instruction set and x86 virtualization which were unavailable on its predecessors, the VIA C7 line, while retaining their encryption extensions. Although nearly identical, there are some differences between the two instruction sets in the semantics of a few seldom used machine instructions (or situations), which are mainly used for system programming. Compilers generally produce executables (i.e. machine code) that avoid any differences, at least for ordinary application programs. This is therefore of interest mainly to developers of compilers, operating systems and similar, which must deal with individual and special system instructions. Intel 64's BSF and BSR instructions act differently than AMD64's when the source is zero and the operand size is 32 bits. The processor sets the zero flag and leaves the upper 32 bits of the destination undefined. AMD64 requires a different microcode update format and control MSRs (model-specific registers) while Intel 64 implements microcode update unchanged from their 32-bit only processors. Intel 64 lacks some MSRs that are considered architectural in AMD64. These include SYSCFG, TOP_MEM, and TOP_MEM2. In 64-bit mode, near branches with the 66H (operand size override) prefix behave differently. Intel 64 ignores this prefix: the instruction has 32-bit sign extended offset, and instruction pointer is not truncated. AMD64 uses 16-bit offset field in the instruction, and clears the top 48 bits of instruction pointer. AMD processors raise a floating point Invalid Exception when performing an FLD or FSTP of an 80-bit signalling NaN, while Intel processors do not. Intel 64 lacks the ability to save and restore a reduced (and thus faster) version of the floating-point state (involving the FXSAVE and FXRSTOR instructions). AMD processors ever since Opteron Rev. E and Athlon 64 Rev. D have reintroduced limited support for segmentation, via the Long Mode Segment Limit Enable (LMSLE) bit, to ease virtualization of 64-bit guests. When returning to a non-canonical address using SYSRET, AMD64 processors execute the general protection fault handler in privilege level 3, while on Intel 64 processors it is executed in privilege level 0. Early AMD64 processors (typically on Socket 939 and 940) lacked the CMPXCHG16B instruction, which is an extension of the CMPXCHG8B instruction present on most post-80486 processors. Similar to CMPXCHG8B, CMPXCHG16B allows for atomic operations on octal words. This is useful for parallel algorithms that use compare and swap on data larger than the size of a pointer, common in lock-free and wait-free algorithms. Without CMPXCHG16B one must use workarounds, such as a critical section or alternative lock-free approaches. Its absence also prevents 64-bit Windows prior to Windows 8.1 from having a user-mode address space larger than 8 terabytes. The 64-bit version of Windows 8.1 requires the instruction. Early AMD64 and Intel 64 CPUs lacked LAHF and SAHF instructions in 64-bit mode. AMD introduced these instructions (also in 64-bit mode) with their Athlon 64, Opteron and Turion 64 revision D processors in March 2005 while Intel introduced the instructions with the Pentium 4 G1 stepping in December 2005. The 64-bit version of Windows 8.1 requires this feature. Early Intel CPUs with Intel 64 also lack the NX bit of the AMD64 architecture. This feature is required by all versions of Windows 8.x. Early Intel 64 implementations (Prescott and Cedar Mill) only allowed access to 64 GB of physical memory while original AMD64 implementations allowed access to 1 TB of physical memory. Recent AMD64 implementations provide 256 TB of physical address space (and AMD plans an expansion to 4 PB), while some Intel 64 implementations could address up to 64 TB. Physical memory capacities of this size are appropriate for large-scale applications (such as large databases), and high-performance computing (centrally oriented applications and scientific computing). 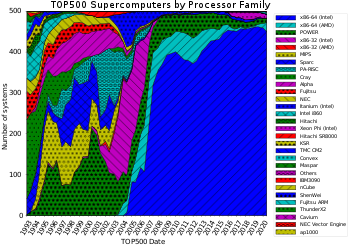 An area chart showing the representation of different families of microprocessors in the TOP500 supercomputer ranking list, from 1992 to 2014. In supercomputers tracked by TOP500, the appearance of 64-bit extensions for the x86 architecture enabled 64-bit x86 processors by AMD and Intel (light olive with circles, and red with circles on the diagram provided in this section, respectively) to replace most RISC processor architectures previously used in such systems (including PA-RISC, SPARC, Alpha and others), as well as 32-bit x86 (green with dots and purple with dots on the diagram), even though Intel itself initially tried unsuccessfully to replace x86 with a new incompatible 64-bit architecture in the Itanium processor. As of 2018[update], the main non-x86 CPU architecture which is still used in supercomputing is the Power ISA used by IBM POWER microprocessors (blue with a diamond pattern on the diagram), with SPARC being far behind in numbers on TOP500, while in 2011 a Fujitsu SPARC64 VIIIfx based supercomputer without co-processors reached number one (while it since dropped off top-10). The first ARM-based supercomputer appeared on the list in 2018 and, in recent years, non-CPU architecture co-processors (GPGPU) have also played a big role in performance. Intel's Xeon Phi "Knights Corner" coprocessors, which implement a subset of x86-64 with some vector extensions, are also used, along with x86-64 processors, in the Tianhe-2 supercomputer. The following operating systems and releases support the x86-64 architecture in long mode. Preliminary infrastructure work was started in February 2004 for a x86-64 port. This development later stalled. Development started again during July 2007 and continued during Google Summer of Code 2008 and SoC 2009. The first official release to contain x86-64 support was version 2.4. FreeBSD first added x86-64 support under the name "amd64" as an experimental architecture in 5.1-RELEASE in June 2003. It was included as a standard distribution architecture as of 5.2-RELEASE in January 2004. Since then, FreeBSD has designated it as a Tier 1 platform. The 6.0-RELEASE version cleaned up some quirks with running x86 executables under amd64, and most drivers work just as they do on the x86 architecture. Work is currently being done to integrate more fully the x86 application binary interface (ABI), in the same manner as the Linux 32-bit ABI compatibility currently works. x86-64 architecture support was first committed to the NetBSD source tree on June 19, 2001. As of NetBSD 2.0, released on December 9, 2004, NetBSD/amd64 is a fully integrated and supported port. 32-bit code is still supported in 64-bit mode, with a netbsd-32 kernel compatibility layer for 32-bit syscalls. The NX bit is used to provide non-executable stack and heap with per-page granularity (segment granularity being used on 32-bit x86). OpenBSD has supported AMD64 since OpenBSD 3.5, released on May 1, 2004. Complete in-tree implementation of AMD64 support was achieved prior to the hardware's initial release because AMD had loaned several machines for the project's hackathon that year. OpenBSD developers have taken to the platform because of its support for the NX bit, which allowed for an easy implementation of the W^X feature. The code for the AMD64 port of OpenBSD also runs on Intel 64 processors which contains cloned use of the AMD64 extensions, but since Intel left out the page table NX bit in early Intel 64 processors, there is no W^X capability on those Intel CPUs; later Intel 64 processors added the NX bit under the name "XD bit". Symmetric multiprocessing (SMP) works on OpenBSD's AMD64 port, starting with release 3.6 on November 1, 2004. It is possible to enter long mode under DOS without a DOS extender, but the user must return to real mode in order to call BIOS or DOS interrupts. It may also be possible to enter long mode with a DOS extender similar to DOS/4GW, but more complex since x86-64 lacks virtual 8086 mode. DOS itself is not aware of that, and no benefits should be expected unless running DOS in an emulation with an adequate virtualization driver backend, for example: the mass storage interface. Linux was the first operating system kernel to run the x86-64 architecture in long mode, starting with the 2.4 version in 2001 (preceding the hardware's availability). Linux also provides backward compatibility for running 32-bit executables. This permits programs to be recompiled into long mode while retaining the use of 32-bit programs. Several Linux distributions currently ship with x86-64-native kernels and userlands. Some, such as Arch Linux, SUSE, Mandriva, and Debian allow users to install a set of 32-bit components and libraries when installing off a 64-bit DVD, thus allowing most existing 32-bit applications to run alongside the 64-bit OS. Other distributions, such as Fedora, Slackware and Ubuntu, are available in one version compiled for a 32-bit architecture and another compiled for a 64-bit architecture. Fedora and Red Hat Enterprise Linux allow concurrent installation of all userland components in both 32 and 64-bit versions on a 64-bit system. x32 ABI (Application Binary Interface), introduced in Linux 3.4, allows programs compiled for the x32 ABI to run in the 64-bit mode of x86-64 while only using 32-bit pointers and data fields. Though this limits the program to a virtual address space of 4 GB it also decreases the memory footprint of the program and in some cases can allow it to run faster. 64-bit Linux allows up to 128 TB of virtual address space for individual processes, and can address approximately 64 TB of physical memory, subject to processor and system limitations. Mac OS X 10.4.7 and higher versions of Mac OS X 10.4 run 64-bit command-line tools using the POSIX and math libraries on 64-bit Intel-based machines, just as all versions of Mac OS X 10.4 and 10.5 run them on 64-bit PowerPC machines. No other libraries or frameworks work with 64-bit applications in Mac OS X 10.4. The kernel, and all kernel extensions, are 32-bit only. Mac OS X 10.5 supports 64-bit GUI applications using Cocoa, Quartz, OpenGL, and X11 on 64-bit Intel-based machines, as well as on 64-bit PowerPC machines. All non-GUI libraries and frameworks also support 64-bit applications on those platforms. The kernel, and all kernel extensions, are 32-bit only. Mac OS X 10.6 is the first version of macOS that supports a 64-bit kernel. However, not all 64-bit computers can run the 64-bit kernel, and not all 64-bit computers that can run the 64-bit kernel will do so by default. The 64-bit kernel, like the 32-bit kernel, supports 32-bit applications; both kernels also support 64-bit applications. 32-bit applications have a virtual address space limit of 4 GB under either kernel. OS X 10.8 includes only the 64-bit kernel, but continues to support 32-bit applications. The 64-bit kernel does not support 32-bit kernel extensions, and the 32-bit kernel does not support 64-bit kernel extensions. macOS uses the universal binary format to package 32- and 64-bit versions of application and library code into a single file; the most appropriate version is automatically selected at load time. In Mac OS X 10.6, the universal binary format is also used for the kernel and for those kernel extensions that support both 32-bit and 64-bit kernels. Solaris 10 and later releases support the x86-64 architecture. For Solaris 10, just as with the SPARC architecture, there is only one operating system image, which contains a 32-bit kernel and a 64-bit kernel; this is labeled as the "x64/x86" DVD-ROM image. The default behavior is to boot a 64-bit kernel, allowing both 64-bit and existing or new 32-bit executables to be run. A 32-bit kernel can also be manually selected, in which case only 32-bit executables will run. The isainfo command can be used to determine if a system is running a 64-bit kernel. For Solaris 11, only the 64-bit kernel is provided. However, the 64-bit kernel supports both 32- and 64-bit executables, libraries, and system calls. x64 editions of Microsoft Windows client and server—Windows XP Professional x64 Edition and Windows Server 2003 x64 Edition—were released in March 2005. Internally they are actually the same build (5.2.3790.1830 SP1), as they share the same source base and operating system binaries, so even system updates are released in unified packages, much in the manner as Windows 2000 Professional and Server editions for x86. Windows Vista, which also has many different editions, was released in January 2007. Windows 7 was released in July 2009. Windows Server 2008 R2 was sold in only x64 and Itanium editions; later versions of Windows Server only offer an x64 edition. 8 TB of virtual address space per process, accessible from both user mode and kernel mode, referred to as the user mode address space. An x64 program can use all of this, subject to backing store limits on the system, and provided it is linked with the "large address aware" option. This is a 4096-fold increase over the default 2 GB user-mode virtual address space offered by 32-bit Windows. 8 TB of kernel mode virtual address space for the operating system. As with the user mode address space, this is a 4096-fold increase over 32-bit Windows versions. The increased space primarily benefits the file system cache and kernel mode "heaps" (non-paged pool and paged pool). Windows only uses a total of 16 TB out of the 256 TB implemented by the processors because early AMD64 processors lacked a CMPXCHG16B instruction. Under Windows 8.1 and Windows Server 2012 R2, both user mode and kernel mode virtual address spaces have been extended to 128 TB. These versions of Windows will not install on processors that lack the CMPXCHG16B instruction. Ability to run existing 32-bit applications (.exe programs) and dynamic link libraries (.dlls) using WoW64 if WoW64 is supported on that version. Furthermore, a 32-bit program, if it was linked with the "large address aware" option, can use up to 4 GB of virtual address space in 64-bit Windows, instead of the default 2 GB (optional 3 GB with /3GB boot option and "large address aware" link option) offered by 32-bit Windows. Unlike the use of the /3GB boot option on x86, this does not reduce the kernel mode virtual address space available to the operating system. 32-bit applications can, therefore, benefit from running on x64 Windows even if they are not recompiled for x86-64. Both 32- and 64-bit applications, if not linked with "large address aware," are limited to 2 GB of virtual address space. Ability to use up to 128 GB (Windows XP/Vista), 192 GB (Windows 7), 512 GB (Windows 8), 1 TB (Windows Server 2003), 2 TB (Windows Server 2008/Windows 10), 4 TB (Windows Server 2012), or 24 TB (Windows Server 2016) of physical random access memory (RAM). LLP64 data model: "int" and "long" types are 32 bits wide, long long is 64 bits, while pointers and types derived from pointers are 64 bits wide. Kernel mode device drivers must be 64-bit versions; there is no way to run 32-bit kernel mode executables within the 64-bit operating system. User mode device drivers can be either 32-bit or 64-bit. 16-bit Windows (Win16) and DOS applications will not run on x86-64 versions of Windows due to the removal of the virtual DOS machine subsystem (NTVDM) which relied upon the ability to use virtual 8086 mode. Virtual 8086 mode cannot be entered while running in long mode. Full implementation of the NX (No Execute) page protection feature. This is also implemented on recent 32-bit versions of Windows when they are started in PAE mode. Instead of FS segment descriptor on x86 versions of the Windows NT family, GS segment descriptor is used to point to two operating system defined structures: Thread Information Block (NT_TIB) in user mode and Processor Control Region (KPCR) in kernel mode. Thus, for example, in user mode GS:0 is the address of the first member of the Thread Information Block. Maintaining this convention made the x86-64 port easier, but required AMD to retain the function of the FS and GS segments in long mode – even though segmented addressing per se is not really used by any modern operating system. Early reports claimed that the operating system scheduler would not save and restore the x87 FPU machine state across thread context switches. Observed behavior shows that this is not the case: the x87 state is saved and restored, except for kernel mode-only threads (a limitation that exists in the 32-bit version as well). The most recent documentation available from Microsoft states that the x87/MMX/3DNow! instructions may be used in long mode, but that they are deprecated and may cause compatibility problems in the future. Some components like Microsoft Jet Database Engine and Data Access Objects will not be ported to 64-bit architectures such as x86-64 and IA-64. Microsoft Visual Studio can compile native applications to target either the x86-64 architecture, which can run only on 64-bit Microsoft Windows, or the IA-32 architecture, which can run as a 32-bit application on 32-bit Microsoft Windows or 64-bit Microsoft Windows in WoW64 emulation mode. Managed applications can be compiled either in IA-32, x86-64 or AnyCPU modes. Software created in the first two modes behave like their IA-32 or x86-64 native code counterparts respectively; When using the AnyCPU mode, however, applications in 32-bit versions of Microsoft Windows run as 32-bit applications, while they run as a 64-bit application in 64-bit editions of Microsoft Windows. Both PlayStation 4 and Xbox One and their successors incorporate AMD x86-64 processors, based on the Jaguar microarchitecture. Firmware and games are written in x86-64 code; no legacy x86 code is involved. Since AMD64 and Intel 64 are substantially similar, many software and hardware products use one vendor-neutral term to indicate their compatibility with both implementations. AMD's original designation for this processor architecture, "x86-64", is still sometimes used for this purpose, as is the variant "x86_64". Other companies, such as Microsoft and Sun Microsystems/Oracle Corporation, use the contraction "x64" in marketing material. The term IA-64 refers to the Itanium processor, and should not be confused with x86-64, as it is a completely different instruction set. Most BSD systems such as FreeBSD, MidnightBSD, NetBSD and OpenBSD refer to both AMD64 and Intel 64 under the architecture name "amd64". Some Linux distributions such as Debian, Ubuntu, Gentoo Linux refer to both AMD64 and Intel 64 under the architecture name "amd64". Microsoft Windows's x64 versions use the AMD64 moniker internally to designate various components which use or are compatible with this architecture. For example, the environment variable PROCESSOR_ARCHITECTURE is assigned the value "AMD64" as opposed to "x86" in 32-bit versions, and the system directory on a Windows x64 Edition installation CD-ROM is named "AMD64", in contrast to "i386" in 32-bit versions. Sun's Solaris' isalist command identifies both AMD64- and Intel 64-based systems as "amd64". Java Development Kit (JDK): the name "amd64" is used in directory names containing x86-64 files. The Linux kernel and the GNU Compiler Collection refers to 64-bit architecture as "x86_64". Some Linux distributions, such as Fedora, openSUSE, Arch Linux, Gentoo Linux refer to this 64-bit architecture as "x86_64". Apple macOS refers to 64-bit architecture as "x86-64" or "x86_64", as seen in the Terminal command arch and in their developer documentation. Breaking with most other BSD systems, DragonFly BSD refers to 64-bit architecture as "x86_64". Haiku refers to 64-bit architecture as "x86_64". x86-64/AMD64 was solely developed by AMD. AMD holds patents on techniques used in AMD64; those patents must be licensed from AMD in order to implement AMD64. Intel entered into a cross-licensing agreement with AMD, licensing to AMD their patents on existing x86 techniques, and licensing from AMD their patents on techniques used in x86-64. In 2009, AMD and Intel settled several lawsuits and cross-licensing disagreements, extending their cross-licensing agreements. ^ Various names are used for the instruction set. Prior to the launch, x86-64 and x86_64 were used, while upon the release AMD named it AMD64. Intel initially used the names IA-32e and EM64T before finally settling on "Intel 64" for its implementation. Some in the industry, including Apple, use x86-64 and x86_64, while others, notably Sun Microsystems (now Oracle Corporation) and Microsoft, use x64. The BSD family of OSs and several Linux distributions use AMD64, as does Microsoft Windows internally. ^ In practice, 64-bit operating systems generally do not support 16-bit applications, although modern versions of Microsoft Windows contain a limited workaround that effectively supports 16-bit InstallShield and Microsoft ACME installers by silently substituting them with 32-bit code. ^ "Debian AMD64 FAQ". Debian Wiki. Retrieved May 3, 2012. ^ a b c "x86-64 Code Model". Apple. Retrieved November 23, 2012. ^ a b "Solaris 10 on AMD Opteron". Oracle. Retrieved December 9, 2010. ^ a b "Microsoft 64-Bit Computing". Microsoft. Archived from the original on December 12, 2010. Retrieved December 9, 2010. ^ "AMD64 Port". Debian. Retrieved November 23, 2012. ^ "Gentoo/AMD64 Project". Gentoo Project. Retrieved May 27, 2013. ^ a b c d e f g h i j k l m n o p q r AMD Corporation (December 2016). "Volume 2: System Programming" (PDF). 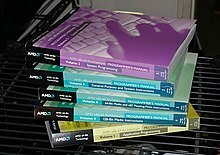 AMD64 Architecture Programmer's Manual. AMD Corporation. Retrieved March 25, 2017. ^ Raymond Chen (October 31, 2013). "If there is no 16-bit emulation layer in 64-bit Windows, how come certain 16-bit installers are allowed to run?". ^ IBM Corporation (September 6, 2007). "IBM WebSphere Application Server 64-bit Performance Demystified" (PDF). p. 14. Retrieved April 9, 2010. Figures 5, 6 and 7 also show the 32-bit version of WAS runs applications at full native hardware performance on the POWER and x86-64 platforms. Unlike some 64-bit processor architectures, the POWER and x86-64 hardware does not emulate 32-bit mode. Therefore applications that do not benefit from 64-bit features can run with full performance on the 32-bit version of WebSphere running on the above mentioned 64-bit platforms. ^ "AMD Discloses New Technologies At Microporcessor Forum" (Press release). AMD. October 5, 1999. Archived from the original on March 8, 2012. Retrieved November 9, 2010. ^ "AMD Releases x86-64 Architectural Specification; Enables Market Driven Migration to 64-Bit Computing" (Press release). AMD. August 10, 2000. Archived from the original on March 8, 2012. Retrieved November 9, 2010. ^ "Intel 64 and IA-32 Architectures Software Developer's Manual, Volume 3A: System Programming Guide, Part 1" (PDF). pp. 4–10. Retrieved May 29, 2010. ^ a b "BIOS and Kernel Developer's Guide (BKDG) For AMD Family 10h Processors" (PDF). p. 24. Retrieved February 27, 2016. Physical address space increased to 48 bits. ^ Shanley, Tom (1998). Pentium Pro and Pentium II System Architecture. PC System Architecture Series (Second ed.). Addison-Wesley. p. 445. ISBN 0-201-30973-4. ^ Microsoft Corporation. "What is PAE, NX, and SSE2 and why does my PC need to support them to run Windows 8 ?". Retrieved March 19, 2013. ^ a b c d "Memory Limits for Windows Releases". MSDN. Microsoft. November 16, 2013. Retrieved January 20, 2014. ^ "5-Level Paging and 5-Level EPT" (PDF). Intel. May 2017. Retrieved June 17, 2017. ^ "Opteron 6100 Series Motherboards". Supermicro Corporation. Retrieved June 22, 2010. ^ "Supermicro XeonSolutions". Supermicro Corporation. Retrieved June 20, 2010. ^ "Opteron 8000 Series Motherboards". Supermicro Corporation. Retrieved June 20, 2010. ^ "Tyan Product Matrix". MiTEC International Corporation. Retrieved June 21, 2010. ^ "Craig Barrett confirms 64 bit address extensions for Xeon. And Prescott". The Inquirer. February 17, 2004. ^ "Intel 64 Architecture". Intel. Retrieved June 29, 2007. ^ "VIA to launch new processor architecture in 1Q08" (subscription required). DigiTimes. Retrieved July 25, 2007. ^ Stokes, Jon (January 23, 2008). "Isaiah revealed: VIA's new low-power architecture". Ars Technica. Retrieved January 24, 2008. ^ "VIA Launches VIA Nano Processor Family" (Press release). VIA. May 29, 2008. Retrieved May 25, 2017. ^ "VIA Isaiah Architecture Introduction" (PDF). VIA. January 23, 2008. Archived from the original (PDF) on September 7, 2008. Retrieved July 31, 2013. ^ Wasson, Scott. "64-bit computing in theory and practice". The Tech Report. The Tech Report. Retrieved March 22, 2011. ^ "Intel 64 and IA-32 Architectures Software Developer's Manual Volume 2 (2A, 2B & 2C): Instruction Set Reference, A-Z" (PDF). Intel. September 2013. pp. 4–397. Retrieved January 21, 2014. ^ "Intel 64 and IA-32 Architectures Software Developer's Manual Volume 2 (2A, 2B & 2C): Instruction Set Reference, A-Z" (PDF). Intel. September 2013. pp. 4–400. Retrieved January 21, 2014. ^ "How retiring segmentation in AMD64 long mode broke VMware". Pagetable.com. November 9, 2006. Retrieved May 2, 2010. ^ "VMware and CPU Virtualization Technology" (PDF). VMware. Retrieved September 8, 2010. ^ "AMD64 Architecture Programmer's Manual Volume 3: General-Purpose and System Instructions" (PDF). AMD. May 2018. p. 419. Retrieved August 2, 2018. ^ "Intel 64 and IA-32 Architectures Software Developer's Manual Volume 2 (2A, 2B & 2C): Instruction Set Reference, A-Z" (PDF). Intel. September 2014. pp. 4–412. Retrieved December 28, 2014. ^ Maged M. Michael. "Practical Lock-Free and Wait-Free LL/SC/VL Implementations Using 64-Bit CAS" (PDF). IBM. Retrieved January 21, 2014. ^ darwou (August 20, 2004). "Why is the virtual address space 4GB anyway?". The Old New Thing. Microsoft. ^ a b "System Requirements—Windows 8.1". Retrieved April 27, 2014. To install a 64-bit OS on a 64-bit PC, your processor needs to support CMPXCHG16b, PrefetchW, and LAHF/SAHF. ^ "Statistics | TOP500 Supercomputer Sites". Top500.org. Retrieved March 22, 2014. ^ "Sublist Generator | TOP500 Supercomputer Sites". www.top500.org. Retrieved December 6, 2018. ^ "Intel® Xeon PhiTM Coprocessor Instruction Set Architecture Reference Manual" (PDF). Intel. September 7, 2012. section B.2 Intel Xeon Phi coprocessor 64 bit Mode Limitations. ^ "Intel Powers the World's Fastest Supercomputer, Reveals New and Future High Performance Computing Technologies". Retrieved June 21, 2013. ^ "cvs commit: src/sys/amd64/amd64 genassym.c src/sys/amd64/include asm.h atomic.h bootinfo.h coredump.h cpufunc.h elf.h endian.h exec.h float.h fpu.h frame.h globaldata.h ieeefp.h limits.h lock.h md_var.h param.h pcb.h pcb_ext.h pmap.h proc.h profile.h psl.h ..." Retrieved May 3, 2009. ^ "AMD64 port". Retrieved May 3, 2009. ^ "DragonFlyBSD: GoogleSoC2008". Retrieved May 3, 2009. ^ "Summer of Code accepted students". Retrieved May 3, 2009. ^ "DragonFlyBSD: release24". Retrieved May 3, 2009. ^ "Tutorial for entering protected and long mode from DOS". Archived from the original on February 22, 2017. Retrieved July 6, 2008. ^ Andi Kleen. "Andi Kleen's Page". This was the original paper describing the Linux x86-64 kernel port back when x86-64 was only available on simulators. ^ "Arch64 FAQ". April 23, 2012. You can either use the multilib packages or a i686 chroot. ^ a b Thorsten Leemhuis (September 13, 2011). "Kernel Log: x32 ABI gets around 64-bit drawbacks". www.h-online.com. Archived from the original on October 28, 2011. Retrieved November 1, 2011. ^ a b "x32 - a native 32-bit ABI for x86-64". linuxplumbersconf.org. Retrieved November 1, 2011. ^ a b "x32-abi". Google Sites. Retrieved November 1, 2011. ^ "AMD64 Port". debian.org. Retrieved October 29, 2011. ^ "Apple – Mac OS X Xcode 2.4 Release Notes: Compiler Tools". Apple Inc. April 11, 2007. Archived from the original on April 22, 2009. Retrieved November 19, 2012. ^ "Apple – Mac OS X Leopard – Technology - 64-bit". Apple Inc. Archived from the original on January 12, 2009. Retrieved November 19, 2012. ^ "Mac OS X v10.6: Macs that use the 64-bit kernel". Apple Inc. Retrieved November 29, 2012. ^ John Siracusa. "Mac OS X 10.6 Snow Leopard: the Ars Technica review". Ars Technica LLC. Retrieved June 20, 2010. ^ "Mac OS X Technology". Apple Inc. Archived from the original on March 28, 2011. Retrieved November 19, 2012. ^ "Microsoft Raises the Speed Limit with the Availability of 64-Bit Editions of Windows Server 2003 and Windows XP Professional | News Center". news.microsoft.com. Retrieved August 14, 2016. ^ "A description of the x64-based versions of Windows Server 2003 and of Windows XP Professional x64 Edition". Microsoft Support. Retrieved August 14, 2016. ^ "Windows Server 2003 SP1 Administration Tools Pack". Microsoft Download Center. Archived from the original on August 27, 2016. Retrieved August 14, 2016. ^ a b "/LARGEADDRESSAWARE (Handle Large Addresses)". Visual Studio 2005 Documentation – Visual C++ – Linker Options. Microsoft. Retrieved June 19, 2010. The /LARGEADDRESSAWARE option tells the linker that the application can handle addresses larger than 2 gigabytes. ^ a b c Matt Pietrek (May 2006). "Everything You Need To Know To Start Programming 64-Bit Windows Systems". Microsoft. Retrieved May 24, 2010. ^ Chris St. Amand (January 2006). "Making the Move to x64". Microsoft. Retrieved May 24, 2010. ^ "Behind Windows x86-64's 44-bit Virtual Memory Addressing Limit". Retrieved July 2, 2009. ^ a b "64-bit programming for Game Developers". Retrieved August 21, 2013. ^ "Memory Limits for Windows Releases". Microsoft. Retrieved February 20, 2013. ^ Anand Lal Shimpi (May 21, 2013). "The Xbox One: Hardware Analysis & Comparison to PlayStation 4". Anandtech. Retrieved May 22, 2013. ^ "The Tech Spec Test: Xbox One Vs. PlayStation 4". Game Informer. May 21, 2013. Retrieved May 22, 2013. ^ "An example file from Linux 3.7.8 kernel source tree displaying the usage of the term x86_64". Archived from the original on September 23, 2005. Retrieved February 17, 2013. ^ "Patent Cross License Agreement Between AMD and Intel". January 1, 2001. Archived from the original on June 21, 2007. Retrieved August 23, 2009. ^ "AMD Intel Settlement Agreement". ^ Stephen Shankland and Jonathan E. Skillings (November 12, 2009). "Intel to pay AMD $1.25 billion in antitrust settlement". CNET. Retrieved April 24, 2012. ^ Smith, Ryan (November 12, 2009). "AMD and Intel Settle Their Differences: AMD Gets To Go Fabless". AnandTech. Archived from the original on May 13, 2010. Intel Software Network: "64 bits"